What is Calls9 Knowledge Plus? Calls9 Knowledge Plus is a powerful cloud-based knowledge management software that enables businesses in legal, education, and commercial industries to communicate better and share knowledge while streamlining business processes. It is a modular solution that combines company-wide search, document storage, compliance, and chat across the organization allowing teams to chat and share knowledge via mobile and desktop devices. The platform offers an integrated approach to the modern workspace with innovative tools to improve intranet communication, knowledge management, and management of the most demanding tasks. Calls9 Knowledge Plus is built to be easy to use for all those who need to access information stored within it. It offers endless possibilities with uniquely designed modules which include team collaboration tools, information & document management, brand asset management, knowledge management, compliance, and HR. Calls9 Knowledge Plus is a highly configurable package which takes information and document management to a whole new level. It’s a reliable, cloud-based knowledge management suite that allows you to store or share documents via mobile and desktop devices. The platform is primarily designed to help remote workers and sales & marketing teams to collaborate within shared channels and manage operations with ease. The solution comes with robust team collaboration tools that allow you to monitor the distribution of information. Its centralizes knowledge and allows you to manage it from one location with the backing of comprehensive reporting systems that track all teams activity and enable teams to remotely collaborate in an online environment. This makes Calls9 Knowledge Plus an ideal platform for teams working outside the office environment, in separate offices, and those working on different floors. Additionally, Calls9 Knowledge Plus features information guides that are structured to offer easy and quick access to critical knowledge within an organization. It comes with easy to use forms which facilitate ease of use when adding content. In addition, the sophisticated but easy to manage bulletin and messaging system leverages email and push notifications to keep everyone in your organizations up to date. Better still, the program’s apps and websites incorporate powerful analytics which enables you to track user engagement and measure the relevance of your content. Its integrated approach makes it easy to view analytics for all users and content in a single interface. If you are interested in Calls9 Knowledge Plus it could also be a good idea to examine other subcategories of Best Knowledge Management Software listed in our database of B2B software reviews. Each company has different wants and needs an application that can be personalized for their size, type of employees and customers, and the specific industry they are in. For these reasons, no software can provide perfect features off-the-shelf. When you look for a software app, first be sure what you require it for. Read some Calls9 Knowledge Plus reviews and ask yourself do you want basic tools or do you need complex functionality? Are there any industry-specific functionalities that you are seeking? Obtain the answers to these questions to assist your search. There are plenty of factors that you need to mull over and these include your budget, specific business needs, your organization size, integration needs etc. Take your time, check out a few free trials, and finally zero in on the app that provides all that you need to improve your organization competence and productivity. How Much Does Calls9 Knowledge Plus Cost? Calls9 Knowledge Plus doesn’t avail its enterprise details to the public. Contact the vendor for a detailed pricing quote. We realize that when you make a decision to buy Knowledge Management Software it’s important not only to see how experts evaluate it in their reviews, but also to find out if the real people and companies that buy it are actually satisfied with the product. That’s why we’ve created our behavior-based Customer Satisfaction Algorithm™ that gathers customer reviews, comments and Calls9 Knowledge Plus reviews across a wide range of social media sites. The data is then presented in an easy to digest form showing how many people had positive and negative experience with Calls9 Knowledge Plus. With that information at hand you should be equipped to make an informed buying decision that you won’t regret. What are Calls9 Knowledge Plus pricing details? 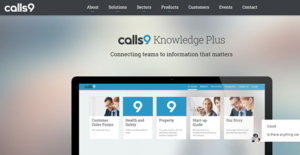 What integrations are available for Calls9 Knowledge Plus?